The Abaco Islands lie in the northern Bahamas and comprise the main islands of Great Abaco and Little Abaco, together with the smaller islands of Elbow Cay (Hope Town), Great Guana Cay, Lubbers Quarters, Green Turtle Cay and Man-O-War Cay to name the most well known. Located 200 miles east of Fort Lauderdale and 75 miles north of Nassau, Abaco has nearly 649 square miles of real estate and is the second largest island in the Bahamas. The islands in this 120-mile chain vary with quaint Cape Cod-like villages built by the early settlers, waterfront restaurants and bars, boutique hotels and residential real estate developments. Early History: First inhabited by the Lucayans, the first European settlers to make their home in Abaco were Loyalists (people loyal to the British Crown) fleeing from the fall-out of the American Revolution. They arrived in 1783 and it is the Loyalist influence that shaped the modern day Abaco. They used Abaco property to establish cotton plantations. For a few years, the cotton industry thrived. But the boom bust when pests destroyed the crop. Most of the settlers left Abaco and the population dwindled from about 2,000 to 400. However, fishing and wooden boatbuilding – a skill that has survived to this day – kept the economy afloat. Current Development: The beautiful sunny sand beaches and crystal clear waters of the Abaco, especially Hope Town on Elbow Cay, are a sailor and fishermans paradise and a second homeowners dream come true. 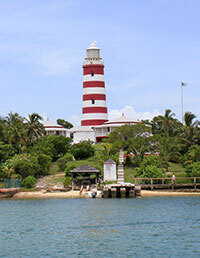 Hope Town , long known for its candy-striped lighthouse, which is the last kerosene-lit lighthouse in the world has become hugely popular with North Americans as a vacation home and second home spot. Sailing boats anchor in Hope Town Harbour for months at a time and join in with the community activities of the locals and second home owners. Hope Town is not just sun, sand, sea and sail – There are thriving cultural activities to participate in from the historical Wyannie Malone Museum, Art exhibitions, Writers groups, Yoga retreats, Musical performances, Festivals and more. 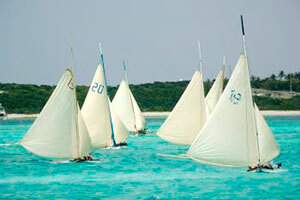 Abaco boasts one of the largest barrier reefs in the world, fantastic diving and fishing grounds, beaches & bird life. Fun restaurants and bars are scattered throughout Abaco with names such as, Nippers, Crackers P’s, Pete’s Pub, and Hope Town Lodge Reef Bar. 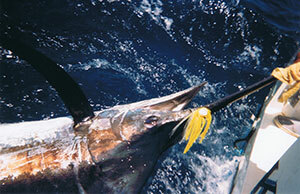 Abaco also plays host to exciting big game fishing tournaments and sailing regattas. Many anglers end up buying Abaco real estate after a tournament. The property owners are known for their strong community spirit and love of the history and environment that makes Abaco so special. Community pride is evident everywhere – the houses, cottages and villas are painted in beautiful pastel colors. It’s rare to find a home or property that hasn’t been lovingly maintained. From the charming, New England-like cottages to Colonial mansions on the sea to Golf & Marina developments - Abaco has something for everyone.